China Glaze – QT… and I can't wait for their Halloween set! First of all, here is QT, from the OMG collection! This is the only OMG polish I own, I love the color! And look at their Halloween set that’ll be released in a few weeks! I can’t wait for Crimson and the Ghoulish Glow, but I want the whole set… makes me think I’ll skip the OPI set with the green glow and black shatter since I like the white glow and black crackle better anyway. This entry was posted in general polish yumminess, swatches, YAY! 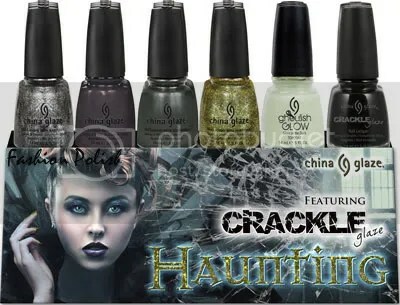 and tagged black, china glaze, crackle, dark, glow, glow in the dark, halloween, holo, holographic, magenta, nail polish, news, pink, qt on July 26, 2011 by hollyshimmerspark. This is my first crackle polish. My Mom surprised me with it in my birthday gift bag, so I had to give it a try. It was actually fun to play with even though I thought I wouldn’t be into the crackles! Here is the LA Colors bottle if you wanted to see what was underneath, it is called Caribbean Pink. I put it over a plain pinkish ridge filler. Maybe I’ll give another color or two a try. I can NOT wait to find an Ulta with the new China Glaze Metro Collection, I’m dying of impatience! This entry was posted in general polish yumminess, swatches and tagged caribbean pink, crackle, fractured foil, la colors, nail polish, pink, sally hansen, silver on July 8, 2011 by hollyshimmerspark.